Facebook is one platform which is connecting people sitting at different places in the world easily. The users of Facebook feel happy and usually visit it a number of times a day, so think what pleasure you would get if your office is Facebook. Although the work in Facebook office would also be more yet, you will feel happy from inside as working at a Facebook office is a pleasure in itself. This is because; the work might be entirely different as you are no longer required to work with accounts and all unless you are in that department. Rather, you get an opportunity to have look of different people residing in the world and make the day happier with their activities. The environment is quite relaxed and soothing. Facebook has an edge over other sites or the fields as it provides a relaxed and soothing environment. The ambience is relaxed as even if the workload is more, you will not feel the same just due to the interesting work. 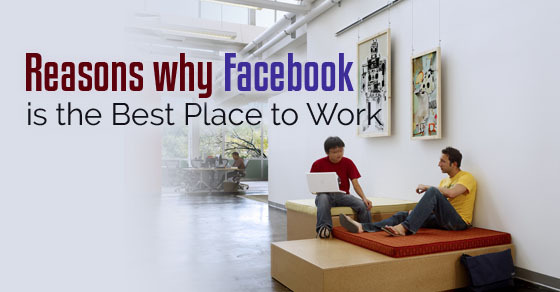 Employees remain happy working there, as some of the statistics also showed that Facebook has an edge over others as it gives 93% satisfaction than any other field. The satisfaction is both in the form of the pay scale and mentally. Liberty is not there, everywhere you go. But at Facebook you get more freedom to exercise what you wish for. There can be lot many factors which contribute to your happiness, but one factor which remains supreme is the freedom that you get. Moreover the social networking site, trust its people. The Facebook encourages its employees and cater to their strengths which is the most important factor to keep the employees happy and satiated. Although money should not be the driving force but yes, in today’s time, no one would like to work with less pay. So, here is the Facebook to pay you more and make you feel happy. Also the researchers from the university of British Columbia found that the people with higher incomes feel better than those who earn less. Also, it is said that on an average the Facebook employee earns about $135,000 on an average. Not just this, social media site Facebook pays 17% above the market rate. Also, if you want to do internship then you would be the happiest intern as they pay an intern about $7400 a month on an average. Recruitment means hiring the employees for the organization. When the employees are hired say in google, it almost takes 6 weeks in an average and also the process is difficult. The Facebook hires the best employees, though it is true for other organizations also but the process of hiring employees on Facebook is easier and less complicated. Facebook gives its employees more growth opportunities than any other social networking site. Also one of the employees from Google has said that it has almost 53,000 employees, but when compared to Facebook, it just has a team of about 10,000 employees which is small and not too large to work with. In other companies you are expected to create something new everyday, even if you are slow in progress, but this certainly is not with the Facebook. Mark zukerberg carries a clear and far sighted vision. The vision to create more open world where people are connected and committed to achieve the goal is unwavering. Having such a leader in the company is always appreciated and also motivates employees towards common organizational goals. Who will want to move away from the place which not only gives you work happiness, but also offers you best perks and allowances. Mark Zukerberg the founder of Facebook is a boss who provides free lunches and free work environment. When you get a chance to de stress yourself without going away from the office, then what else you need. You get the best atmosphere to work. The boss, employee relation is not so direct in other organizations, but here it is direct and without any hindrance. You are free to talk to the boss without any hesitation. Bosses are usually very busy and are hard to talk to easily. So, here you can get effective and regular communication with the boss, thus helping you in maintaining the pro communication environment. The Facebook has a small team and when the team is small, you get to work more as there is less hinderance and there is more room for the growth and success. Also larger the group or the team, more complicated will the communication become and also you will find difficulty in working where the work delays than being completed. So, this is also one of the reasons to choose Facebook as the platform to work and prove your potential. The work of the employees is examined at large scale and not the way you dress yourself or the way you have decorated your desk at work. The CEO of the Facebook himself dresses in normal jeans and hoodies which exemplifies that work matters and not the clothes or the personality. So, this is a positive point for those who like to work irrespective of getting examined through their clothes and the way people dress. This is so obvious that if you are aspiring to work for a social media platform, then the work will be more social without any cubicles. You would be able to walk and talk. In short, working in a very comfortable environment which you might not get anywhere else. The work you do is an investment for the company. When the company gives you lucrative incentives with perks and other allowances, the investment you put in for the company would also be great and appreciable. So, both the work culture and the investment you put in the form of the work proves to be fruitful, hence making you happy and providing inner peace. No other place will give you the opportunity to feel the compact world, but the Facebook surely gives you the chance to see the world connected and compact. Every individual makes use of Facebook, your family members, friends and all others on the earth probably use it with internet connection. So, it makes the world a global village for you and others who also make use of the social networking site. Learning is a never ending process. If you are keen learner and observer, you surely will learn lot many things, both technically and otherwise, by being in a socially challenged work. This kind of work is not available anywhere in the world except in the Facebook office. So, for this reason too it is advisable to work in Facebook. There is lot of creativity involved in Facebook as you are supposed to find ways by which you can contact and retain the users for longer period of time. New methods, techniques are required to be brought in so that the Facebook users do not get bored of using the same platform again and again. Recently when mark zukerberg was about to become a father, he announced paternity leave and also raised the issue of maternity and paternity leaves. These leaves are not given by all the organizations but announced by zukerberg that four months paid leave will be given both to the women and men. So, this is great for all the would be parents who are working in Facebook. Also for those who aspire to work there. There should be no communication gap between the employees and the boss, if the goal is to be achieved. The similar smooth and flawless communication is available on Facebook. When there is no fear of talking to his boss, the happiness of working automatically comes and also even does not affect the punctuality in the office on a daily basis. The Facebook promotes an open culture in the office that is, the ideas and the opinions are free to flow without any form of criticism. So, this is also one of the motivating factor among the employees which drives them to work harder everytime without making them feel bored and monotonous. The most important factor which employees feel comfortable in is working from home. Yes, Facebook also gives you an opportunity to work from home when you want to. Though it has some cons, the many pros of working from home covers it up. So, this type of freedom to employees is like the cherry on the cake and is also appreciated by all. So, this valued benefit of setting your own hours at work is quite flexible. Who does not love food? Everyone does and this is the right place where you get a great combination of food and work. The food you get is edible enough and is just awesome. At times the employees have to compromise on food if they get good salary, but this is not the place where you have to sacrifice one thing with another. The work would never bore you as everyday the Facebook users wish to see something new whenever they log in. So, you are also expected to do the same. Bring in new ideas, play with your ideas, do experiments and so on. Such things would excite you and also are not available anywhere in the offices or the companies. The office offers you very friendly atmosphere. The friendly environment is good to work on and also ensures the long stay of the employees. You would certainly not want to leave a place where you feel fearless and open to say anything you wish to. Not just this, some employees also hesitate to speak in front of the boss, but to zukerburg you are free to express and share your problems. Also the interns are welcomed and treated well, unlike other organizations. The work is admired by all and especially the boss. Otherwise the bosses are very tight lipped and hardly speaks words to thank the employees. Zukerburg is friendly, open and also admires his employees for their efforts. So, above are some of the points which tells you to work at Facebook and not go anywhere else. Every office has its own policies and codes of conduct which every employee has to follow, but when those rules become a sort of hurdle in one’s freedom, the workplace becomes a nightmare. But, this is not the case with Facebook, so one should work here as per his or her interest. Previous articleHow to Deliver Bad and Good News to your Employees?